Lemon quartz (left) is produced by irradiating rock crystal (right), followed by heating. Lemon colour in quartz is not available naturally. Some of the treatments are not known to the best of laboratories as well, as the treater tries to keep the treatment and the process a secret, in order to pass off a treated stone as natural. So, where and how the individual gemstone dealer is concerned? Can he ignore the treatment? The answer is 'NO'. This is like ignoring 'reality'. It is absolutely necessary that the dealer not only knows about the treatment but also shares the truth with his customers. "complete disclosure is of utmost importance..."
There is much controversy as to what extent the clients should be informed about the treatment of stones. Some trade members feel that if and when there are chances that a treated stone would change its appearance, the customer should always be told about the same. However, if the treatment is stable, it is not necessary to disclose, but morally be disclosed. However, the author personally believes whether a gemstone treatment is stable or unstable, it must be disclosed in all conditions, although, there are few which cannot be identified by gemmological testing. But, a gem owner-dealer knows better about his gem! 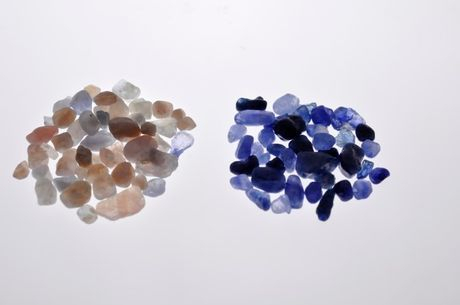 Colours of dyed sillimanite (left and centre) and dyed beryl (right) being represented as sapphire, ruby and emerald, respectively. directly from the dealer rather than subsequently from others, especially from his competitors?" "this is like ignoring the reality"
The problem arises when the dealers themselves do not know that the stones have been treated and they are thus selling a treated stones. Till quite recently, they have not even given it a thought. The reason for this is that the suppliers did not disclose the treatment because they thought a treated stone would be harder to sell and in the process the problem was ignored in the hope that it would go away. But, this returned back to hit them like a boomerang and they could not escape it. We have already witnessed this recently with the 'emerald debacle' in the Jaipur market. While interacting with many emerald dealers, who are also the cutters, I came across few cases, when an examined emerald turned out to be filled with resin, while the gem dealers were completely unaware about this. Rather, they were shocked to learn that their emeralds were resin-filled. They were more in dismay due to the fact that the emeralds were cut and polished in their factories, and as a routine cutting procedure emeralds were placed in colourless oil. Then, how can resin be present in these emeralds? And that too in few stones and not the whole parcel! The fact is that emerald rough was previously treated with resin, where the resin entered into the open fissures or fractures - the 'reality' ignored while buying the rough. Now, when the rough was worked through cutting and polishing process, some of the already-treated fractures were removed, while some still made their way into the cut stones. So, when these emeralds are analyzed for fillers, the signs of resin as well as oil are observed. Some gems have always been treated - emeralds have always been oiled! The whole concept of treatment is to make unsalable material available for the market at affordable prices, for the masses. With the advancement of technology, with sophistication of vacuum pumps, pressurized ovens, chambers, environment changing media, chemicals, etc, it is now possible to produce an array of colours which were never available in natural gemstones. And these treated gem varieties keep the wallets intact! ....then why make all this fuss? The problem with us is not the treatment but its acceptance without feeling guilty. I have come across many traders, who do not want to declare the treatments clearly to their customers even today - in the times of internet and social networking. While they know, a customer now is much more educated and informed than ever before. 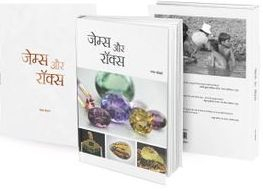 Trade associations like The World Trade Confederation (CIBJO), International Colored Gemstone Association (ICA), American Gem Trade Association (AGTA), etc ask their members to compulsorily mention on their invoices, whether the gemstones are natural or treated, along with the stability of the treatment/s. And, if the buyer wants to know more about the treatment, the supplier has to reveal the same to him. Till the end of last century, many of jewellers were worried about the nature of the stone and were only concerned, whether the stone had surface breaks, or any other inclusions, whether the colour is correct and whether it is salable. In the process they were selling stones without even knowing about the presence of treatments on them. However, with the growing trend of hiring gemmological knowledge into their businesses, the reality could not be ignored. In the point of view of few gem dealers I know, it is apparent that a jeweller would buy a stone up to a certain price if it looked like a natural stone and after the particular price barrier where a natural stone would be too expensive, he would prefer a treated stone. For example, if at 100 dollars, a natural stone is as good as a treated stone at 80 dollars, he would buy the natural one, however, if the natural stone costs at 150 dollars, he would buy a treated stone....now, just imagine these figures in multiples of tens, hundreds or thousands....the price difference between a natural and treated stone will keep on increasing significantly. It is obvious that a natural stone would have preference over a treated stone if the price difference was marginal, otherwise the reverse would hold. However, there will still be few exceptions that would prefer a natural stone at any price difference. As a result of the above mentioned observation, one would naturally ask whether the jewellery industry is educating the ultimate customer. In most markets like USA, Europe, Japan, etc, there is a trend for disclosure, but majority of gem dealers / jewellers tag along what can be called as, a 'smart disclosure', where complete information is not provided, i.e. tell something, hold something. The same trend is being followed in India as well.....and as far as I know, only a handful of jewellers are into complete disclosure, only few are into 'smart disclosure' while majority is simply not bothered. How many disclose that the diamonds are glass-filled when a piece of 'kundan-meena' jewellery is on sale, or how many disclose that the rubies are glass filled, sapphires are diffusion-treated or emeralds are resin-filled. Rather, there are people who prefer not furnishing gem reports of the labs who provide complete disclosure and then there are also few gem labs, which do not bother to completely disclose the treatments but concentrate more on turnovers. We as professionals, as a gem dealer or a jeweller or a gemmologist, should insist that the truth should not be hidden because if and when litigation will start, there will be no end to it. It is moral and legal obligation for us to divulge any information which may affect the value of the gemstone. Keep eyes and ears open! Gem dealers, jewellers or gemmologists have to update themselves constantly and on daily basis because not only the variety of gemstones that are subject to treatment is increasing but the whole method of treatment is becoming very sophisticated. This is more important for a gemmologist, as gemstone identification is his core area in the gemstone pipeline. He has to be suspicious all the time and must examine every important stone with extra care and alertness. A laboratory report is as good as the knowledge of the gemmologist and therefore, the gemmologist has to be sharp and remain sharp. Coming back to the earlier question, will the ultimate consumer accept a stone which has its colour and beauty being enhanced by some form of treatment? The stones which are always treated, and the treatment is permanent and where there are no comparable natural stones, the difference does not arise. However, where two stones have the same colour, quality and permanence and look identical and where the treated stone is only duplicating the nature, both the stones would cost the same. No one bothers, if an aquamarine is heated or not, a rubellite is irradiated or not. But, there is always a premium for the original and untreated counterpart. All treatments should be revealed whether permanent or temporary, whether it affects the price or not; it should not only be mentioned but also specified within the trade. The process of having faith all the way down from the miner to the manufacturer to the dealer to the jeweller has to be rebuilt so that the consumer confidence can be achieved for the growth of our own coloured gemstones business.